The fight to protect liberty and justice never ends. Since 1973, donor-supported PLF has successfully litigated to enforce the Constitution’s guarantee of individual liberty, with an unmatched track record at the U.S. Supreme Court. Your support empowers countless Americans to fight back and win, at the same time you safeguard the liberties of everyone. 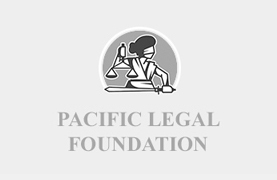 Pacific Legal Foundation is a 501(c)(3) nonprofit organization. © Pacific Legal Foundation, 2019.